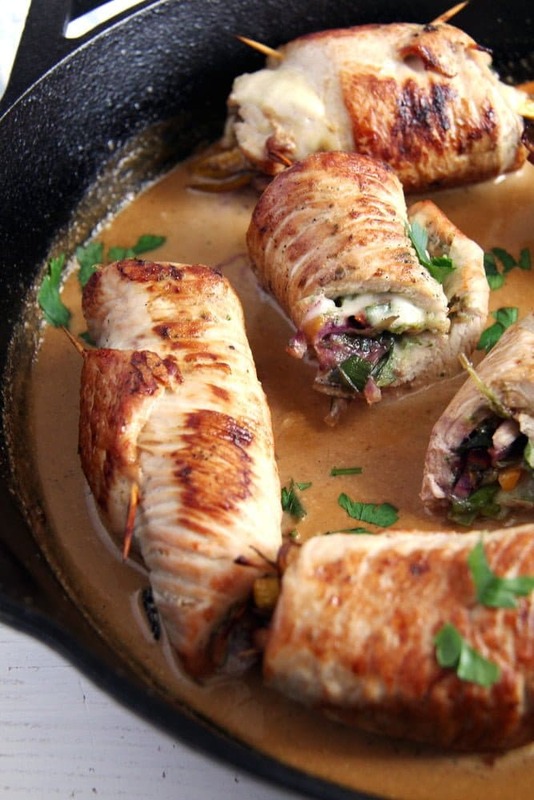 A different way of serving turkey this Thanksgiving or Christmas: turkey rolls stuffed with Gouda cheese and julienne vegetables in a delicious white wine and cream sauce. So, in preparation for Thanksgiving or Christmas I decided to have a small series of turkey recipes here on the blog. We all love turkey in our family and that is why cooking (and eating) for this series has been particularly enjoyable for all of us. We are lucky enough to be able to buy our turkey here in the village from a farm raising turkeys, chickens and geese and I always think that the farm turkeys taste better than the turkey I buy when we run out of the farm poultry. The turkeys we get to buy here are huge, so large that they could never fit in our freezer or in the oven in one piece. Even if I was able to get it in the oven to cook it, we would probably need one week to eat it all. So, when I am cooking with turkey it is always with smaller pieces of it and never an entire bird. To make this recipe I used some of the cutlets I cut from the turkey breast. I did my best to cut them rather thinly so that they are easily rolled and the rolls are not very thick. If you do cut your own cutlets it really helps if you either only half defrost the turkey breast before cutting it or, if your turkey breast is fresh, put it in the freezer until slightly frozen. This makes the slicing of the meat so much easier, if you ask me. The easiest solution though is to buy ready cut turkey cutlets, I always do that if I don’t happen to have a whole turkey breast in the freezer or if I cannot be bothered with slicing the meat myself. I used my homemade herb garlic paste to smear on the turkey cutlets, I absolutely love that stuff, it is pretty addictive, I put it into most of the things I am cooking nowadays. If you have been reading my blog for a while, you might have noticed that I am a total garlic junkie… and I like salty things… so, that paste is the food of gods for me. 🙂 However, if you do make that paste and use it for this recipe (or any other recipe) be careful with the addition of salt afterward, the paste is a condiment and very salty, I rarely have to use extra salt to adjust the taste of a dish when using the garlic parsley paste. If you don’t make the paste, feel free to use any other herb-garlic paste you have or pesto, whatever kind of pesto you like. The kind of pesto you use will slightly change the taste of the Skillet Turkey Rolls Stuffed with Cheese and Vegetables, but as pesto is always delicious, it won’t really matter if you use regular basil pesto, wild garlic pesto, parsley pesto or even mint pistachio pesto. A word concerning the cheese as well. I used Gouda slices, but Cheddar will be just as good. And for a change you could even take some freshly grated Parmesan instead of the sliced cheese, I tried that as well, it is delicious. 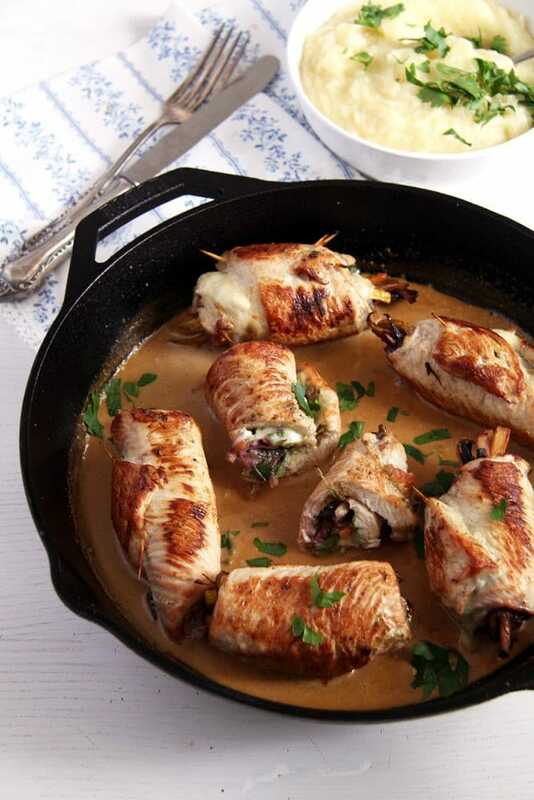 The sliced cheese will melt and start to ooze out of the rolls, I was a bit disappointed when seeing that the first time, but got happy again when I started eating and I just loved that melty cheese. Not to mention the kids, they particularly love the melting cheese. 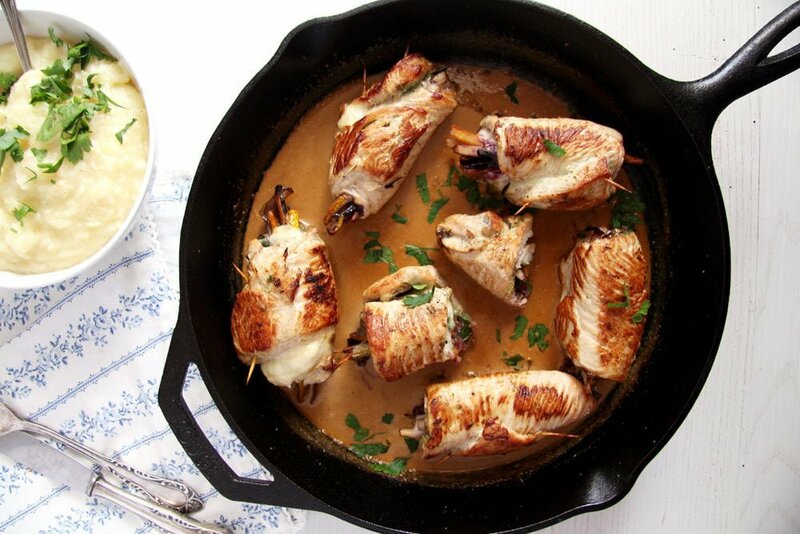 If you don’t want to use wine for the sauce, although it is particularly delicious and the alcohol cooks off anyway, you could replace it with good quality chicken stock. Place the turkey cutlets flat on the working surface and season lightly with salt and pepper. If you are using my homemade herb garlic paste, don't salt the cutlets anymore, the paste includes lots of salt. Smear the cutlets with pesto or garlic parsley paste. Place the cheese slice on top. To make the filling julienne the carrots, parsnip, spring onions and zucchini. Heat 1 tablespoon oil in the skillet (or another ovenproof pan) and add the vegetables. Cook for about 4-5 minutes until slightly softened. Adjust the taste with some salt and pepper, but again leave away the salt if using the salty homemade garlic parsley paste. Remove the vegetables from the pan. Leave to cool slightly, just enough for you to be able to handle them without burning your fingers, it won't take long. Arrange the vegetables on the turkey cutlets, roll the cutlets and secure each one with one or two toothpicks. Give the second tablespoon oil to the skillet. Fry the turkey rolls for about 5 minutes, turning them often so that they get brown on all sides. Add the white wine to the rolls and place the skillet in the oven. Bake for 10 to 12 minutes or until the turkey rolls are cooked through but not overcooked. 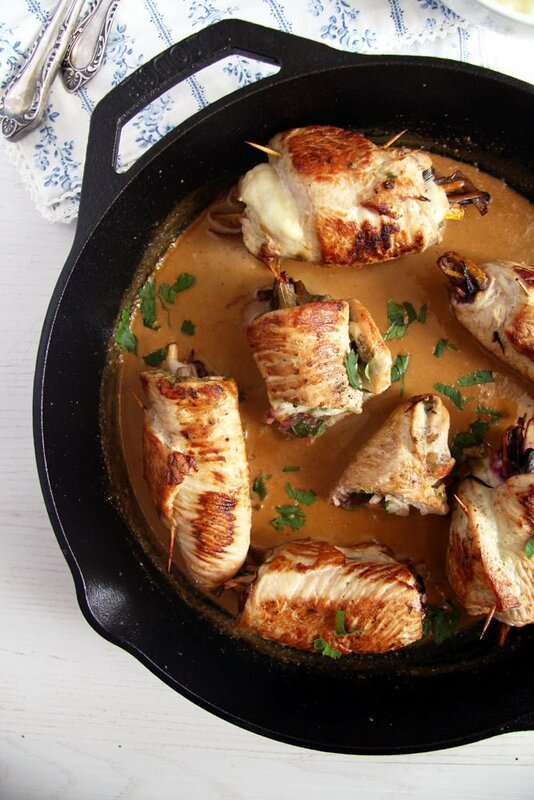 Remove the cutlets from the skillet and keep warm while you make the sauce. Add the double cream and the milk to the pan and simmer for about 3-4 minutes or until the sauce thickens slightly. Give the cutlets back to the pan, sprinkle some chopped parsley on top and serve immediately with mashed potatoes or celeriac and potato puree and a green salad. These rolls look so delicious with pesto-cheese-veggie filling and creamy sauce! These are SO genius! 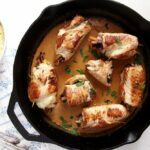 Looks so delicious, and such a great way to switch up the old fashioned turkey recipe. Saving now! Such a wonderful recipe Adina! I am loving the sound or your homemade garlic paste!!! Mmmm…Also partially freezing the turkey before cutting is a great tip. Your lucky family gets to sample all this delicious turkey fare!!! This recipe looks delicious! I love the idea of your turkey series. I’ve been stuck on chicken a little too much recently, and should mix things up with some turkey. I’ll keep watching for your ideas! what a fantastic way to prepare turkey! i love your stuffing, and the presentation can’t be beaten! Beautiful rolls, Adina! I must start putting cheese into my rolls too… I love meat rolls and prepare them quite often, but it’s been years since I had turkey (here I can get only antibiotic-pumped battery turkey meat and I refuse to buy it). You are so lucky to have access to healthy farm turkey!